The report, written by a panel of nutrition, agriculture and environmental experts, and published in the medical journal Lancet , recommends a plant-based diet, based on previously published studies linking red meat consumption to increased risk of health problems. The report also comes amid recent studies finding that foods sourced from animals have relatively high environmental footprints per serving compared to other food groups. Our goal is to define a pathway whereby we can feed 10 billion people who will inhabit Earth by 2050. Overall, the diet encourages whole grains, beans, fruits and most vegetables, and says to limit added sugars, refined grains such as white rice and starches like potatoes and cassava. On average, red meat consumption needs to be slashed by 50% globally, though the necessary changes vary by region and reductions would need to be higher in richer countries like the United States. 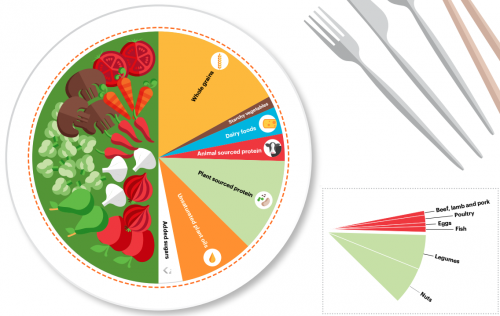 According to the report, a planetary health plate (shown above) should consist by volume of approximately half a plate of vegetables and fruits; the other half, displayed by contribution to calories, should consist of primarily whole grains, plant protein sources, unsaturated plant oils, and (optionally) modest amounts of animal sources of protein. Not surprisingly, the report is controversial. Both the meat and dairy industries dispute the report recommendations, saying their products provide important nutrients and can be part of a healthy diet. Nevertheless, it is clear that how food is produced, what is consumed, and how much is lost or wasted all heavily shape the health of both people and planet. 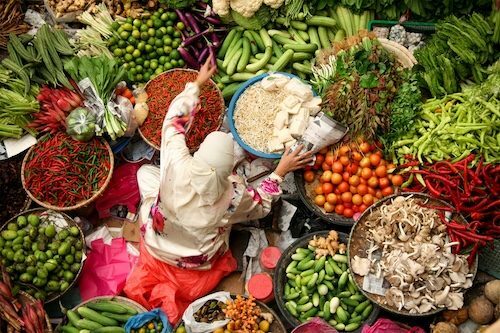 The EAT-Lancet Commission presents a framework and provides quantitative scientific targets for healthy diets and sustainable food production. The EAT-Lancet Commission on Food, Planet, Health. Accessed 2019 Jan 19. The world needs a diet overhaul, expert panel says. CBS News. 2019 Jan 17.